Keep any areas of skin exposed to the sap away from sunlight. Remove any embedded fragments in skin e.g. nettle hairs or thorns (common nettle or Blackthorn). Wash skin with soapy water. Irrigate eyes ( if sap has come into contact with eyes) with eyewash solution. In rare cases individuals may go into anaphylactic shock in such cases medical attention should be sought immediately. Giant Hogweed ( Heracleum mantegazzianum, also giant cow parsley) is a plant in the family Apiaceae, native to the Caucasus region and Central Asia. It is now widespread throughout the British Isles especially along riverbanks. Except for size, it closely resembles Common Hogweed (Heracleum sphondylium), Heracleum sosnowskyi or Garden Angelica (Angelica archangelica). It may reach 2-5 metres (rarely to 7m) tall. It is distinguished by a stout, dark reddish-purple stem and spotted leaf stalks that are hallow and produce sturdy bristles. Stems vary from 3-8 cms in diameter, occasionally up to 10cm. The stem shows a purplish red pigmentation with raised nodules. Each purple spot on the stem surrounds a hair, and there are large, coarse white hairs at the base of the leaf stalk. The plant has deeply incised compound leaves which grow up to 1-1.7m in width. 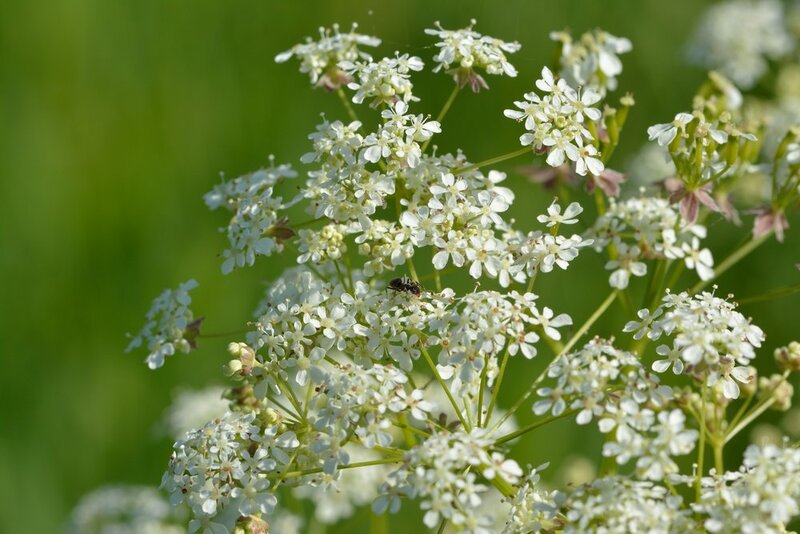 It’s flowers are held in umbels of white flowers, facing upwards. Giant Hogweed is a phototoxic plant. Chemicals within the sap can cause blistering and burning. Causing photodermatitis (severe skin inflammations) when the skin is exposed to sunlight or to UV rays. Initially the skin colours red and starts itching. Then blisters form as in burns within 48 hours. They form black or purplish scars that can last several years. Small amounts of sap in the eyes can lead to temporary or even permanent blindness. Aconitum known as aconite, monk’s-hood, wolf’s-bane, leopard’s bane, women’s bane, devil’s helmet or blue rocket, is a genus of flowering plant belonging to the buttercup family (Ranunculaceae). 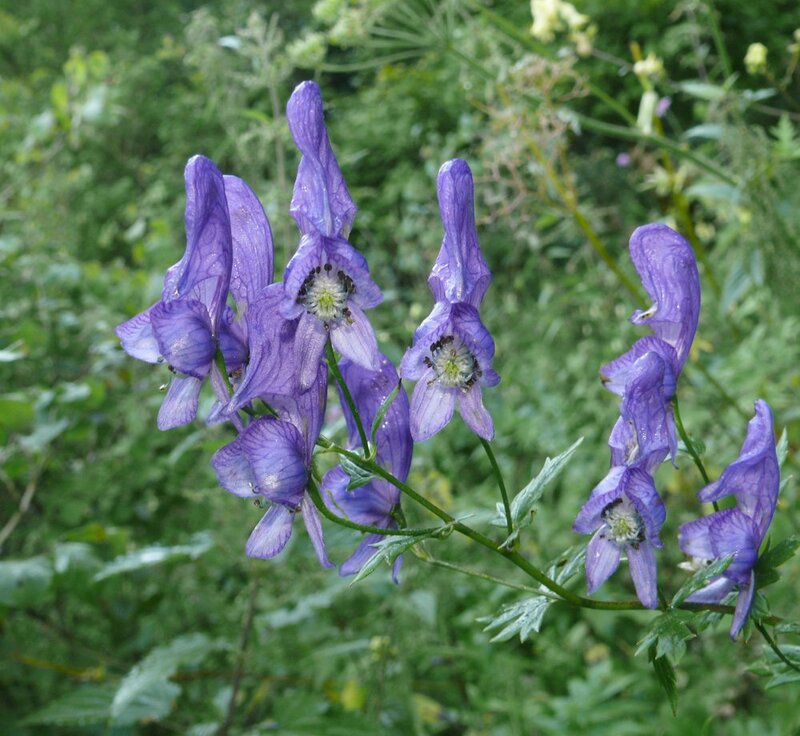 There are over 250 species of Aconitum. The name Monk’s-hood comes from the cylindrical helmet shape. These herbaceous perennial plants are natives of the mountainous parts of the northern hemisphere, growing in moisture retentive but well draining soils on mountain meadows. Their dark green leaves lack stipules. They are palmate or deeply palmately lobed with 5-7 segments. Each segment again is 3-lobed with course sharp teeth. Each flower as numerous stamens. The leaves have a spiral or alternate arrangement. The lower leaves have long petioles. Blue, purple, white, yellow or pink zygomorphic flowers. Poisoning may also occur following picking the leaves without wearing gloves; the toxin is absorbed easily through the skin. The sap oozing from picked leaves will cause cardiac symptoms for a couple of hours. Tingling will start at the point of absorption and extend up the arm to the shoulder, after which the heart will start to be affected. The tingling will be followed by unpleasant numbness. Very toxic if ingested. Symptoms usually arrear very quickly within the hour and with large doses can be fatal. Severe toxicity is not expected from skin contact alone. Symptoms can be nausea, vomiting and diarrhoea. Stinging nettle or common nettle, Urtica dioica, is an herbaceous perennial flowering plant, native to Europe, Asia, Northern Africa, and North America, and now found worldwide. It is the best-known member of the nettle genus Urtica. Stinging nettle is a dioecious herbaceous perennial, 1 to 2m tall in the summer and dying down to the ground in winter. It has widely spreading rhizomes and stolons, which are bright yellow as are the roots. The soft green leaves are 3 to 15cm long and are borne oppositely on an erect wiry green stem. The leaves have a strongly serrated margin, a cordate base and an acuminate tip with a terminal leaf tooth longer than adjacent laterals. It bears small greenish or brownish numerous flowers in dense auxiliary inflorescences. The leaves and stems bare many stinging hairs, whose tips come off when touched, transforming the hair into a needle that will inject several chemicals. This mixture of chemical compounds causes a sting or paresthesia. Contact with the stinging hairs can result in local reddening and itching, swelling and an intense burning sensation. These symptoms are usually of short duration but may last up to 36 hours in sensitive individuals. Daphne mezereum is a species of Daphne in the flowering plant family Thymelaeaceae, native to most of Europe and Western Asia, north to northern Scandinavia and Russia. In southern Europe it is confined to medium to higher elevations and in the subalpine vegetation zone, but descends to near sea level in northern Europe. It is generally confined to soils derived from limestone. The common name is Mezereon. It is a deciduous shrub growing to 1.5m tall. The leaves are soft, 3-8cm long and 1-2cm broad, arranged spirally on the stems. The flowers are produced in early spring on the bare stems before the leaves appear. They have a four-lobed pink or light purple (rarely white) perianth 10-15mm diameter, and are very fragranced. The fruit is a bright red berry 7-12mm diameter. Daphne mezereum is very toxic because of the dahnetoxin present especially in the berries and twigs. If poisoned, victims experience a choking sensation. Handling the fresh twigs can cause rashes and eczema in sensitive individuals. Hebera (English name Ivy, plural Ivies) is a genus of 15 species of climbing or ground- creeping evergreen woody plants in the family Araliaceae, native to western, central and southern Europe. Although far less toxic than poison ivy, which is unrelated to this genus, ivy contains triterpernoid saponins and falcarinol, a polyyne. Falcarinol is capable of inducing an allergic reaction (contact dermatitis). Rhododendron (ponticum), called common rhododendron or pontic rhododendron, is a species of Rhododendron native to southern Europe and southwest Asia. 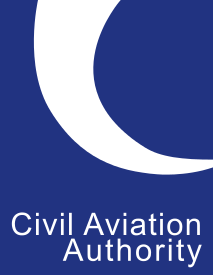 It was first introduced in the UK in the late 18th century. It often grows in sensitive habitats, such as heath, peat lands, broad-leaved woodland, roadside verges and dunes. Rhododendron forms large dense rounded clumps that grow up to 3m. The leaves are 6-12cm in length, oblong in shape, leathery in texture, dark green at the top of the plant and paler below. The flowers are conspicuous and numerous in May/June; flowers form rounded heads, clusters of terminal racemes with 5 parts and the corolla are bell or funnel shaped. Most species have brightly coloured flowers which bloom from late Winter through to early Summer. All parts of the plant contain toxins variously called andromedotoxin, grayanotoxin, rhodotoxin and acetylandromedol and arbutin glucoside. These toxic agents cause internal poisoning via ingestion e.g. consumption of honey produced from Rhododendron flowers. Wild Parsnip (ssp. Sylvestris) is a member of the Apiaceae family, it can form dense stands in rough dry grassland and favours chalky/limestone areas. It spreads quickly in undisturbed areas such as abandoned yards, waste dumps, meadows, open fields, roadsides and railway embankments. Its seeds are easily dispersed by wind and water. Stems can grow to up to 2m in height. Stems are hollow (except at the nodes) and are slightly hairy. The leaves form a rosette at ground level but the stem elongates in the second year. The flowers are yellow with many umbels resembling a carrot top. With stalks of nearly equal length spring from a common point forming a flat or curved surface. The roots and leaves of the Wild Parsnip release sap containing photo-sensitive chemicals that can cause human skin to react to sunlight, resulting in intense burns, rashes or blisters. Blackthorn, sloe (Prunus spinosa) belongs to the Rosaceae family. It is native to the UK and most of Europe and western Asia. It can also be found in New Zealand and eastern North America. It grows best in moist, well drained soil and thrives in full sunlight. It grows naturally in scrub, copses and woodlands, but is commonly used as a hedging plant. The fruit from the Blackthorn is called the Sloe which is harvested in the UK. Spiny and densely branched, mature trees can grow to a height of around 6-7m. The bark is dark brown and smooth, and twigs form straight side shoots, which develop thorns. In winter, twigs are black and spiny with leaf buds along the spines. The leaves are slightly wrinkled, oval, toothed, pointed at the tip and tapered at the base. White flowers appear on short stalks before the leaves in March and April, either singularly or in pairs. The thorns from the blackthorn are sharp and can be painful if they penetrate or simply scratch the skin. The tips of the thorns are brittle and can easily break, leaving fragments buried in the skin. Scratches can and do often become easily infected with swelling and pain experienced in the area of the strike very quickly after the initial impact. In more serious cases a condition called plant thorn arthritis or synovitis can be experienced. Thorns may also carry bacteriololgical infections such as Tetanus, and Leptospirosis. Hemlock water dropwort (Oenanthe crocata) is a member of the Apiaceae family and is the most poisonous indigenous plant in Britain. It can be found in ditches, damp meadows, in streams, by riverbanks and in marshes. It is a large, stout plant between 1-2m high that flowers in July. The lower stem is usually thick and joins to clusters of fleshy tubers that give rise to the popular name “dead man’s fingers”. It resembles celery with its roots like a bunch of white carrots. The entire plant is poisonous. The tubers, stems, and leaves contain oenanthotoxin, a highly unsaturated higher alcohol, which is known to be poisonous and a powerful convulsant. Poisoning by hemlock water droplet is an infrequent event. A number of human fatalities have occurred over the years, although animals are usually victims. Note: The majority of the Apiaceae family are harmless. These include species of celery, parsley, parsnip, and carrots. The poisonous members are hemlock (Conium maculatum), cowbane (Cicuta virosa), hemlock water dropwort, giant hogweed and wild parsnip. Hemlock (Conium maculatum) is a member of the Apiaceae family. It is found throughout England and also in Wales except for the high ground. It is common in Ireland too but records decrease as you go into northern Scotland. Hemlock appears between March to September. It can be found in damp habitats, roadsides, waste ground, field edges, path edges, meadows, and poorly drained soil near streams or ditches. The leaves are a bit fern like with two to four pinnate divisions, the whole looking triangular in shape. A white collection of tiny flowers grow in an umbrella shape in spring. The stem is smooth, grooved, green and usually covered in purple/red spots and streaks and can reach up to 2-3m tall. The plant also has an unpleasant smell.